The farmers reached the Ram Lila Maidan on Thursday night and braved the Delhi cold by spending the night there. Gurudwaras across the city also provided shelter for the farmers. Thousands of farmers across the country took to the streets of Delhi on Thursday as part of a two-day Kisan Mukti March protest in the capital to demand complete loan waivers, minimum support price for crops and the passing for two private members bills by the parliament. The farmers reached Ram Lila Maidan on Thursday night and braved the Delhi cold by spending the night as well. Gurudwaras across the city provided shelter for the farmers who converged in the national capital from Tamil Nadu, Kerala, Meghalaya and other parts of the country to demand the government to look into the agrarian crisis. On Friday, the farmers plan to lead a final walk from Ram Lila Maidan to the Parliament where they demand to have a 21-day special session to address the farmers' issues. "We will unseat the BJP and bring an alternative, and raise your issues in the Parliament. The BJP's brahmastra is the Ram mandir. They rake it up every five years, but we will have to tell them that today the marginalised, the workers, the farmers are all united. They misuse the name of Ram for votes. They talk about Ramayana, but forget Mahabharata. In Mahabharata, the Kauravas used to say how five Pandavas will defeat us. Today, does anybody remember the names of the Kauravas? The growth rate of agriculture has come down under the Modi government as against the growth seen during the UPA era," Yechury was quoted as saying by Indian Express. While addressing the farmers gathered at Parliament Street, Delhi chief minister Arvind Kejriwal said that the Central Government has only five months left and they have to implement the Swaminathan report. He added, "Warna 2019 mein ye kisaan qayamat dha denge." Congress president Rahul Gandhi addresses the farmers march near Parliament Street. According to ANI, he said, "If the loans of industrialists can be waived off, then the debt of farmers must be waived off as well. I assure the farmers of India, we are with you, don't feel afraid. Aapki shakti ne is desh ko banaya hai." He added, "Modi ji had promised MSP will be increased, PM promised bonus, but look at the situation right now, empty speeches are being given and nothing else." Widows and daughters of farmers who committed suicide due to mounting debt take part in the march from Ram Lila Maidan to Parliament Street carrying photos of the dead farmers. Last year, farmers from Tamil Nadu carried the bones of the those who committed suicide in a protest in Delhi. All India Kisan Sangharsh Coordination Committee (AIKSCC) got the permission around midnight to march on Parliament street. They received the permission but had a few conditions. "Delhi Police held multiple rounds of talks with farmers' leaders and gave permission for rallying from Ramlila Maidan to Jantar Mantar, with conditions. We hope that they'll follow the conditions," Deputy commissioner of police, New Delhi, Madhur Verma told Hindustan Times. He added, "Proper arrangements done for security, traffic, and law and order. 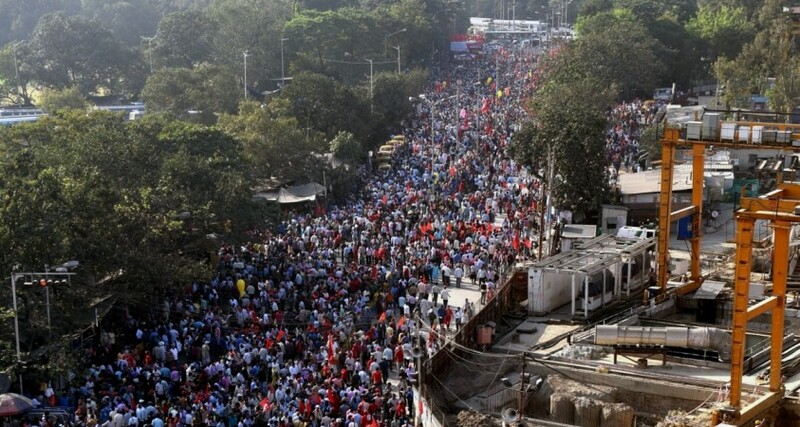 Around 8,000 farmers have reached Ramlila Maidan. They will conclude their march at Parliament Street and culminate their protest from there." The AIKSCC organised the Kisan Mukti March and have managed to bring together thousands of farmers from all over the country to the capital. CPI(M) general secretary Sitaram Yechury said that the farmers are in the capital to collect their dues and that the Modi government is the most 'anti-farmer'. He also said that that government was ignoring the farmers' needs and only focussing on a communal vote bank. Over 13 police forces and 3,500 security personnel have been deployed to ensure no outbreak of violence as farmers marched from Ram Lila Maidan to the Parliament. Around 850 police personnel have been deployed at Central Delhi alone. AAP chief and Delhi chief minister Arvind Kejriwal, NCP leader Sharad Pawar and National Conference chief Farooq Abdullah are expected to join protests. Sharad Yadav will also be joining the protests. The farmers' group from Tamil Nadu have threatened to march naked if they are not allowed to go to the Parliament. On day 2 of the protests, the farmers will march from Ram Lila Maidan to the Parliament to demand a three-week special session to look into the agrarian crisis which has hit the country. Complete loan waivers, implementation of the Swaminathan Commission, the passing of two private members bills and a minimum support price are also part of their demands. "No government can survive without farmers. The Union government must listen to their demands. The farmers of this country have awakened and they cannot be fooled," HD Deve Gowda was quoted as saying by Hindustan Times. While the farmers spent the biting cold night at Ram Lila Maidan, AAP volunteers helped out by providing food and water to the thousands present. The volunteers also helped in pitching tents for the protesters to sleep in.